Military Padded Gun Shoulder Strap Sling with Quick Release Buckle. Color is ACU Camouflage. Condition is New. 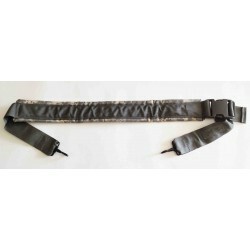 Military Padded Gun Shoulder Strap Sling with Quick Release Buckle. This military gun sling can be used for a cargo bag shoulder strap, utility carry sling or replacement bag sling. The material is heavy duty Cordura Nylon and Nylon Webbing. Snap buckle is super strong. Made in USA. Color is ACU Camouflage. Approximate total size 50" L x 2" W from metal clip tip to metal clip tip, Reduced to smaller size sling measures 40" L x 2" W. (Padded area is 22" L x 2.75" W, Nylon webbing is 2" Wide). Weight is 7 oz. NSN#8465-01-545-3444. Gov manufacturer: Specialty Group, Inc.